My inspiration from Polka Dot Chair.com. I immediately fell for this sign and put it on my to list of must-dos. 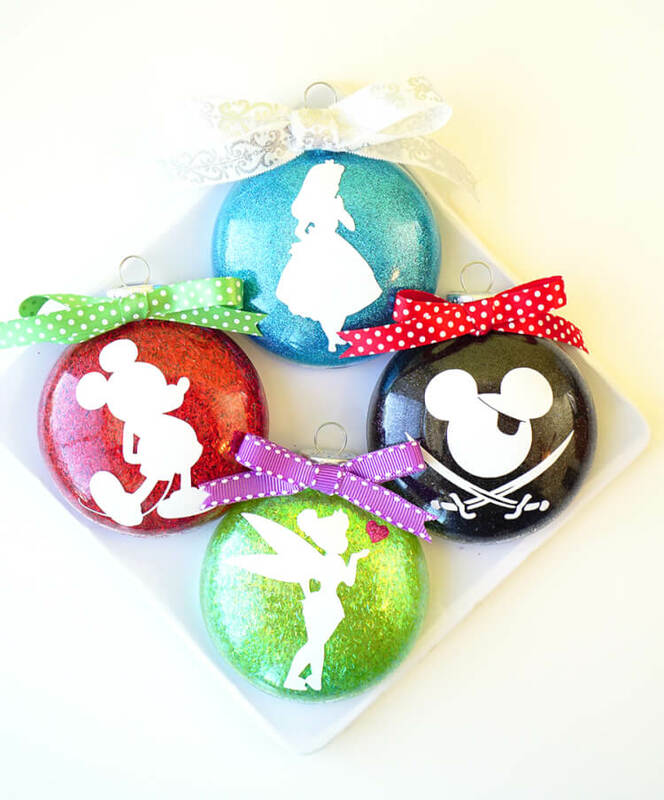 I challenged myself to find a cute Disney craft/decoration I could make for each holiday. It took a lot of surfing Pinterest to compile my list, but thankfully I am on Summer Break so what else does a teacher have to do. I am a huge fan of painting pumpkins versus carving them. So, of course, I was drawn to this pumpkin. 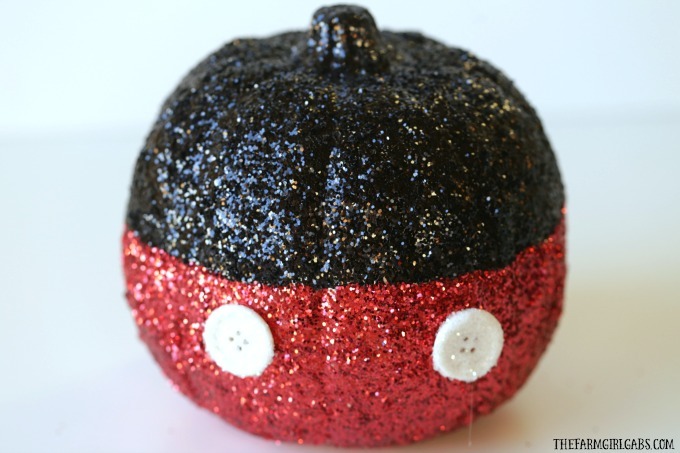 Glitter pumpkin from The Farm Girl Gabs.com. When I was growing up, my mom decorated for every single holiday. I have fallen short of this family tradition. 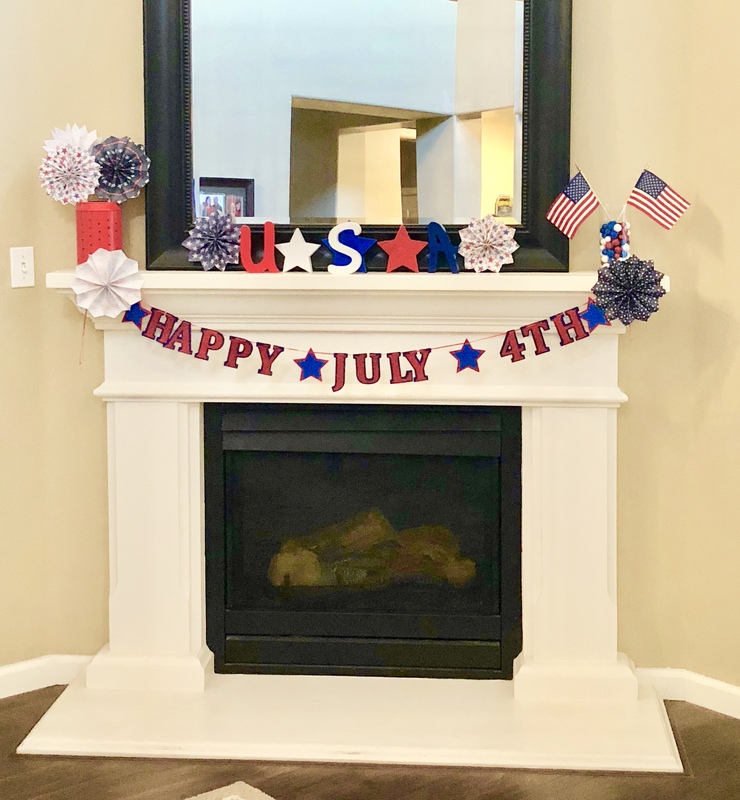 My youngest daughter gets very excited for each holiday and loves to put out decorations. Looking through my stash of decorations, I concluded it was time to seriously update and or replace the entire lot with the exception of some of my Christmas stuff. I actually already made a version of these a couple of years ago. They are super easy and lots of fun. I handled the pouring and swirling of the Pledge and let me daughter pour in the glitter. Each of my daughters chose the character they wanted on their ornament. It’s a fun a family activity! 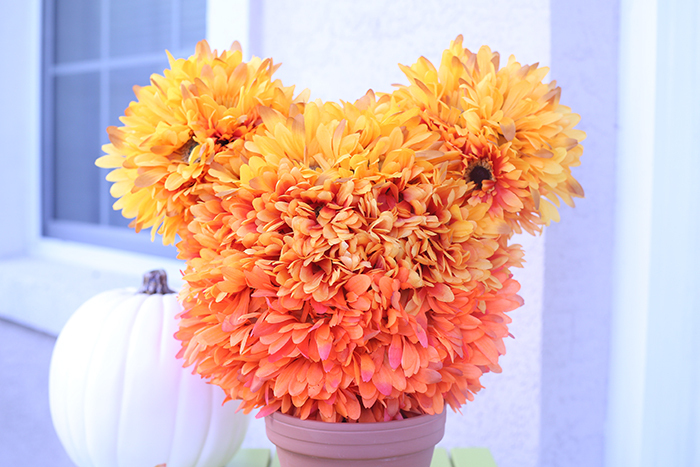 This combination of orange flowers and Mickey Mouse is definitely the best Fall decoration I found! Read the tutorial here. I am absolutely making this on a bigger scale for my porch this year. 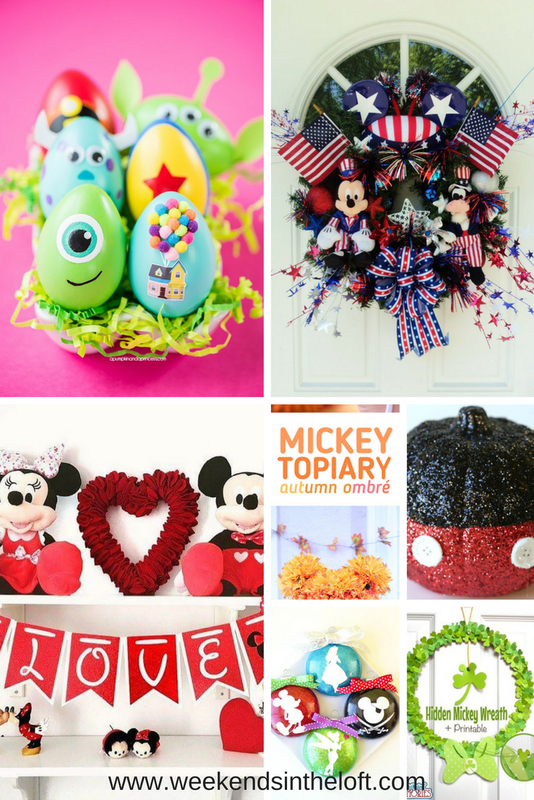 Etsy shops sell wreaths for every occasion you can imagine, and sometimes one fabulous wreath on your front door is all the decorating you need to do. 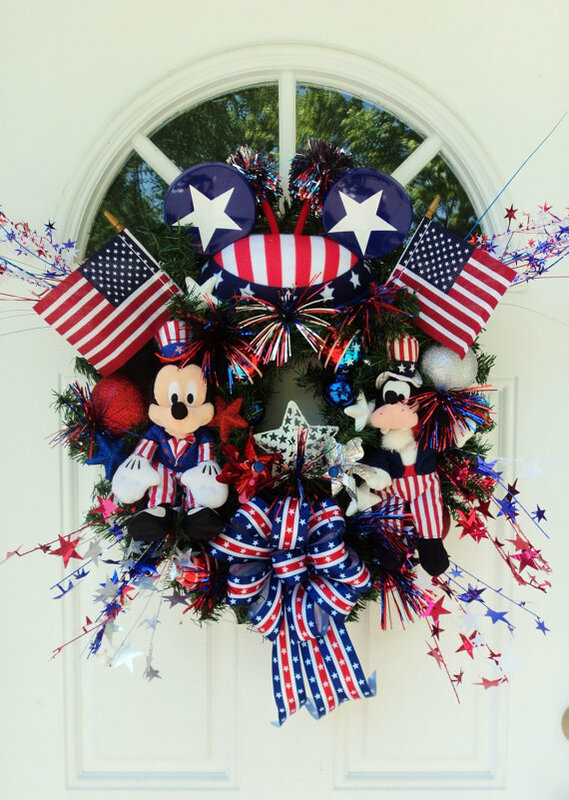 I tried my hand this year at making a 4th of July wreath. However, after seeing this wreath, I may be making another next year. Another decoration that is easily adaptable to any holiday and has become a bit of an obsession for me is the banner. My Target find this year adorned my mantle. I made a few banners for my classroom too. 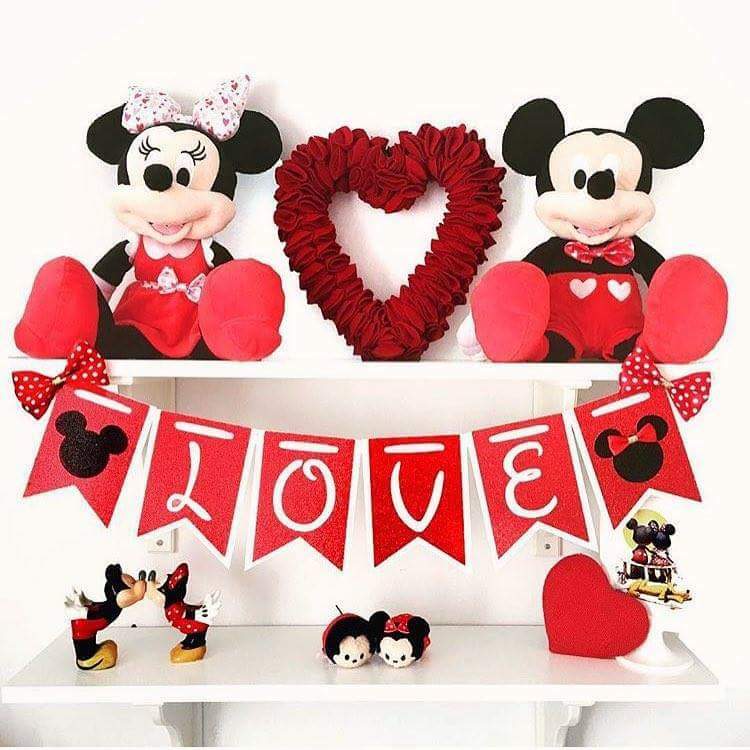 I absolutely love this Mickey and Minnie Valentines banner from You and Kids.com. DIY decorations was the biggest challenge. 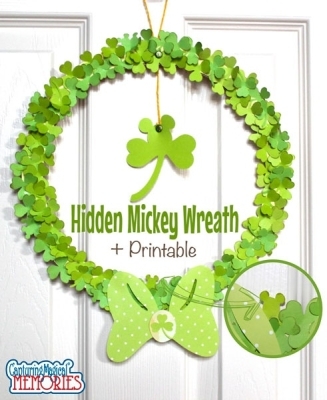 After much searching, I was able to find this hidden Mickey wreath. Get the directions and printables here. I hope enjoyed this collection as much as I did, and I hope you will make a few of these this year!